Giclee (zhee-clay) is a French word that means, "Spray of Ink". 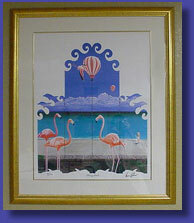 An ink-jet print on water color paper is known as a Giclee. The apparent resolution of this digitally produced art print is 1,800 dots per inch, which is higher than a traditional lithographic print, and offers a wider color range than sophisticated "serigraph" prints. Giclee prints render deep, saturated colors and have a beautiful painterly quality that retains minute detail, subtle tints, and unusual color blends. Most of the world's leading artists are using this process for their limited edition prints. A Certificate of Authenticity accompanies each signed and numbered print.